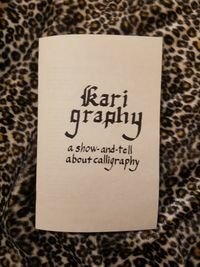 Karigraphy is a tour of calligraphy through the mind and calligraphy marker of Kari Tervo, who first learned calligraphy when she was in 6th grade. Tervo covers calligraphy basics, discusses her history with calligraphy through the years, and talks about the essential gear that one needs to write calligraphy. In her imperfect hand, Tervo displays some of her practice letters and shows off words and phrases that she wrote in five different calligraphy fonts. The cover is made out of parchment paper. The inside-back-cover doubles as a multi-colored parchment mini-poster. It exhibits an inspirational phrase that Tervo wrote in the Gothic font. This page was last modified on 15 December 2017, at 03:30.